Starring Martin Freeman, Paul Whitehouse, Alex Lawther and Andy Nyman. Professor Philip Goodman (Andy Nyman) is a sceptic, making TV documentaries on clairvoyants and mystics, exposing them as frauds. So he definitely doesn’t believe in ghosts. He’s contacted by a predecessor, another sceptic, who has three cases he’s never been able to crack – and he’s starting to believe that everything he’d de-bunked during his career might actually be true. It’s down to Goodman to solve them and finally prove that ghosts are simply nonsense. Or are they? 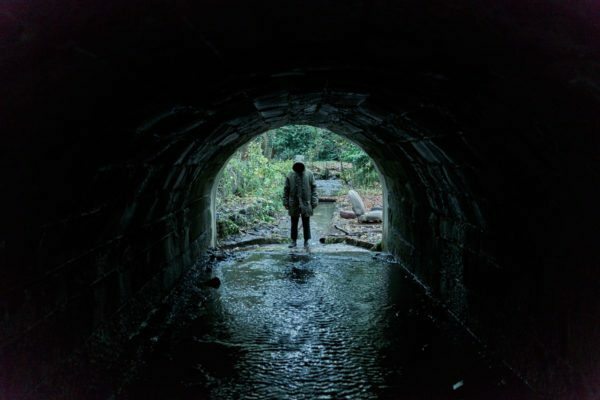 Don’t make the mistake of confusing Andy Nyman and Jeremy Dyson’s Ghost Stories with David Lowery’s piece of indie perfection from last year. This is a very different ball game and a very British one at that, adapted from the duo’s hit stage show, with this version both written and directed by them. It’s an affectionate tribute to British horror, especially of the Hammer variety, a film that delights in taking its audience down different paths, especially when they’ve settled into being taken down a particular direction. It starts out as a mockumentary, with Professor Goodman (Nyman) addressing the camera backstage as he prepares to challenge yet another fraud. His show, Psychic Cheats, echoes similar fodder on so-called reality TV and it’s neatly convincing, as well as being genuinely funny. Making the show puts him back in touch with a fellow sceptic, who’s on his death bed and it’s the set up for three stories – and we’re into a portmanteau set up. Each story is distinct and self-contained. 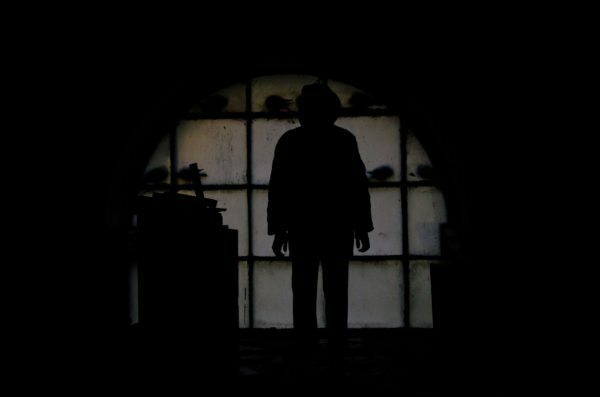 The one about the night watchman (Paul Whitehouse) and what he saw in a former mental asylum. The young man (Alex Lawther), who had a nasty experience in a dark and foggy wood after a car accident. And the unpleasant former City whizz-kid (Martin Freeman, on a sabbatical from the MCU) who now lives on a country estate in an architect designed house which he shares with a poltergeist. And his new born child. Each story stands up in its own right, combining some skin crawling moments with smartly judged humour. Self-confessed horror geeks Nyman and Dyson have produced an affectionate parody, as well as an homage to Hammer, all rolled into one. They’re also very slick at making everyday objects look threatening when they’re viewed from a distance. Watch out for an especially sinister head rest on a car seat! The denouement ventures into different territory, though, and it’s here that the film’s weakness lies. It’s as if Nyman and Dyson have put so much into the rest of the movie that they don’t quite know how to finish it off. 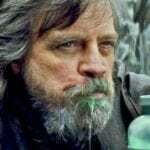 They don’t do a bad job, there’s still some jangling moments and an unpleasantly contemporary piece of racism to go with it, but it doesn’t quite hang together. Even with the Hammer style in mind, it’s a touch contrived and results in a less satisfying conclusion. It does have some very nice performances, though. Alex Lawther as the disturbed young man, panicky behind the wheel of the car, unable to cope with his parents. 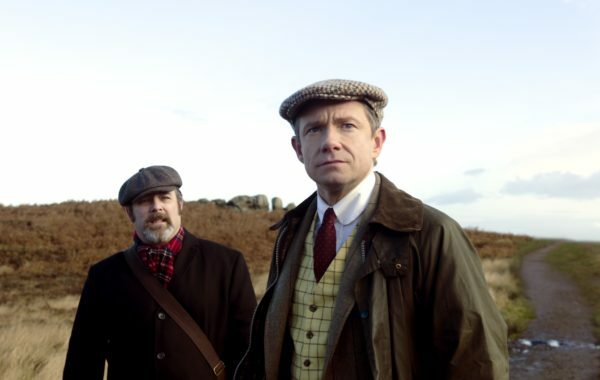 Martin Freeman’s rich land owner has a glorious snort of an upper class laugh, while Paul Whitehouse, inevitably, is more Paul Whitehouse than anything, but with less catchphrases. He’s still convincingly scared when he needs to be. 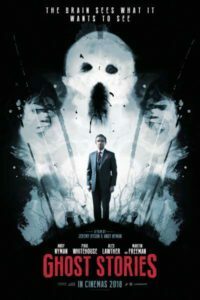 Ghost Stories isn’t actually what you would expect, and it’s all the better for it. It’ll make the hairs on your neck prickle, if not stand up, and it balances those shivers with more than enough laughs. Horror fans will lap it up eagerly, getting all the references and tropes, but it isn’t only for fans. In fact, it’s so much fun, it could make some converts.